Hi There! We are Ken and Candy Jackson, married for the past 3+ decades. We are newly retired and eager for the next phase of our journey. We have a musical duo called "The Mudbugs". 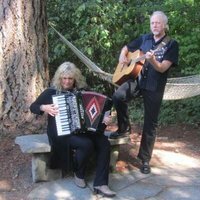 Candy plays accordion while Ken sings and plays guitar. We have 3 very well behaved dogs, an Airedale, a Golden Retriever, and a Wire Fox Terrier. Candy previously owned a national pet products company so she is the animal expert of the duo. Ken is a retired Amtrak Conductor. We currently live in Vancouver, WA which is just across the WA/OR border from Portland. We are both musicians if you consider that a skill :) Ken and Candy both like to hike and ride mountain bikes and can offer guidance for Northwest trails. Candy is an excellent cook/chef and specializes in cooking ethnic foods. Candy has ecommerce and marketing skills and general computer knowledge. California wine country, beaches, and Arizona deserts. We are located in Vancouver, WA which is just across the river from Portland, OR. Vancouver is a pretty city with all the modern conveniences from Costco, Wallmart, Olive Garden, etc. We are bordered by the beautiful Columbia River. It is a 2 hour drive to the lovely coastal town of Cannon Beach, our favorite. 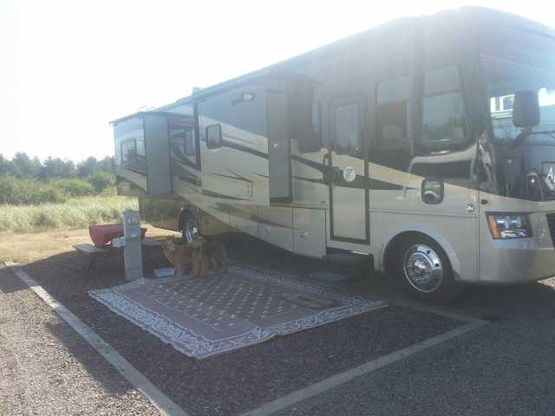 We have a Class A motorhome, 2011 Tiffin Open Road measuring just over 35 feet. We tow a 2007 Suzuki Grand Vitara. We have 3 slides. We stayed two nights at Ken & Candy's thy have a Beautiful place and we loved staying there thy are great folks with a great spot and would have them stay at our place any time we'll fix them up thank you Ken and Candy. Simply fantastic!#! We needed a couple of days in the Vancouver area to visit friends, the Mud bugs were more than accommodating! ! Great location, lots of room & privacy in the pines........ Thank you so much Mudbugs!!!!! Because of plans out of our control we could not stay at the Mudbugs. They completely understood. They also were going to go the extra mile since we had a medical emergency consider a longer stay, which is not the norm. Sorry we missed out on meeting them. The Mudbugs answered my boondocking request quickly. They were very helpful and accommodating to my schedule. With another heat way approaching their area, I changed my itinerary and I am so sorry I couldn't boondock with them on this trip. Anyone traveling through Washington state would enjoy their hospitality!